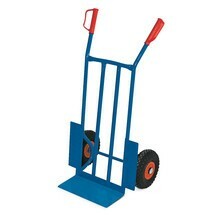 The BASIC handcart is the ideal helper for order picking and the transport of goods in warehouses, workshops or vans. 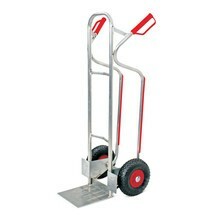 The material of the transport cart is either aluminium or powder-coated steel (RAL 5010). 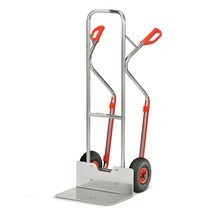 The steel Ameise® hand truck with skids is available in a number of different versions. Customers can choose between puncture-proof, pneumatic or solid rubber tyres. 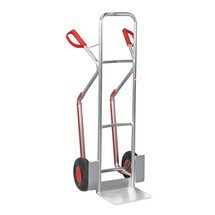 The aluminium Ameise® hand truck with skids is available in a number of different versions. Customers can choose between puncture-proof, pneumatic or solid rubber tyres. With its robust design, the fetra® aluminium hand truck provides a quick and simple means of transporting all manner of items – be it drums, boxes, cartons or furniture. The aluminium construction makes it light and practical, though it can still accommodate loads weighing up to 200 kg. 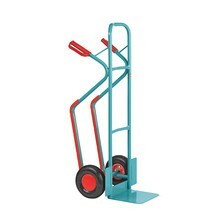 This hand truck from fetra® is available in different versions to suit a wide range of needs. A number of footplate sizes are available, with variable capacities also on offer. This ensures that every customer can find the right truck for their specific application.